The town of Orbost is situated on the Snowy River, near where it crosses the Princes Highway, about 380 km east of Melbourne. A pastoral run was taken up in 1842, but was abandoned because of hostile Aborigines defending their land. 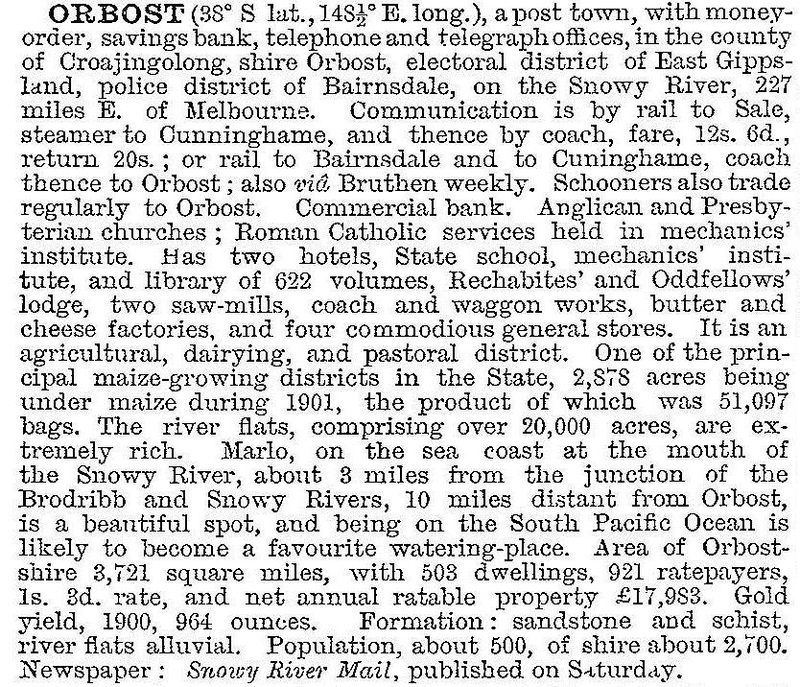 The McLeod brothers took over the run in 1847, naming it Orbost after a place on the Isle of Skye. The McLeods initiated bad relations with local tribes. A station cook was speared about 1850 and a number of Aborigines killed in reprisal. Settlers came to the area in the 1870s, selecting high land. The extensive river flood plain was swampy, but by the 1880s the river flats were being drained. Crops were planted on the rich deep soil, with maize rapidly becoming widespread. A butter factory was established in 1893, serving a fledgling dairy industry. Pigs were raised in association with dairying, supplying a bacon factory established in 1889. A sawmill began in 1878. At first, the district was very isolated, communication being by bullock or horse team through difficult country to Lakes Entrances, many kilometres to the west. In 1875, a schooner entered the Snowy River to collect wattle bark stripped further upstream. A shipping company was formed in 1880, poling barges upstream until the river was snagged in the 1880s. Then a paddlesteamer towed loaded barges to Marlo, at the mouth of the river, where produce was transhipped to waiting vessels. Wooden chutes were constructed along the river banks to load bagged maize onto the barges. Township allotments were first sold in the 1881, and a small settlement was soon growing. A general store commenced business and a hotel was built in 1884. A Mechanics’ Institute hall was constructed in 1885 and a school commenced in 1886. By 1890, there were four general stores, butcher, bootmaker, blacksmiths, saddlers and other businesses, as well as the Snowy River Mail which is still published. The area was part of the Tambo Shire before Croajingolong Shire, centred on Orbost, was formed in 1892. The next year, it was renamed Orbost Shire. The river plain was bounded by forested hills. The timber was cut by local sawmills from the 1880s, and the milled timber shipped out by paddlesteamers. Despite navigation difficulties caused by a sandbar at the mouth of the Snowy River, shipping services expanded in the new century. After 1910, the river trade declined, and ceased with the extension of the railway from Bairnsdale in 1916. There are the remains of a spectacular railway trestle bridge across the river flats. A punt crossed the Snowy River at Orbost from 1884. A bridge was constructed in 1893, but was soon damaged by a huge flood. Flooding was a regular occurrence, the worst inundations being in 1870, 1893, 1925, 1934, 1952 and 1971. Over the years major flood protection works have been implemented. The Princes Highway, which passes Orbost, now crosses the flood plain on raised concrete supports. The town of Orbost grew steadily. A hospital was established in 1929. A higher elementary school commenced classes in 1912, becoming a high school in 1948. A Roman Catholic primary school commenced in 1923 and a second state school in 1950. Timber remained an important part of Orbost’s economy. There have been several sawmills at Orbost, and logging in the forests of far East Gippsland provided employment for a large part of the town’s population. Dairying and raising of beef cattle are important in the area. Extensive areas of maize and beans are harvested, mainly for seed, and many vegetables are grown for the fresh market. However, the community faced an uncertain future with the downturn in the timber industry and in 2013 put togther a plan to advance the town into 2020 with an emphasis on marketing and eco-tourism. New farming practices have encompased the growing, supply and export of sampire, sea spray and other salt water irrigated species. The town has primary and secondary schools, kindergarten, hospital, Anglican, Catholic and Uniting churches, library and a golf course. Two hotels, four motels and a camping and caravan park cater to the growing tourist industry. The historic Slab Hut offers tourist information and souvenirs. The Rainforest Centre contains displays, audiovisuals and landscaped gardens depicting the warm and cool temperate rainforest found in the East Gippsland forests. Australian Wood Design Exhibition, displaying the talents of local woodworkers, is held each January in Orbost. In the same month, Orbost is the venue for the Snowy River Country Music Festival. Orbost’s annual show is held at Newmerella. Between 1890 and 1917 a paddlesteamer, ‘Curlip’, opened on the Snowy River between Orbost and Marlo. In 2008 a replica was built at Orbost, mainly by voluntary labour. It provides cruises and private charters on a not-for-profit basis. The Baldwin Spencer Trail, a 262 km driving tour, begins in Orbost. The route follows Baldwin Spencer’s 1889 expedition to East Gippsland and traverses much spectacular mountain and forest scenery. It includes Cabbage Fan Palms at Cabbage Tree Creek and the unique Gippsland waratah on Errinundra Plateau. The poet, Grace Jennings Carmichael (1867-1904) spent her adolescence at Orbost, many of her poems describing the forest.